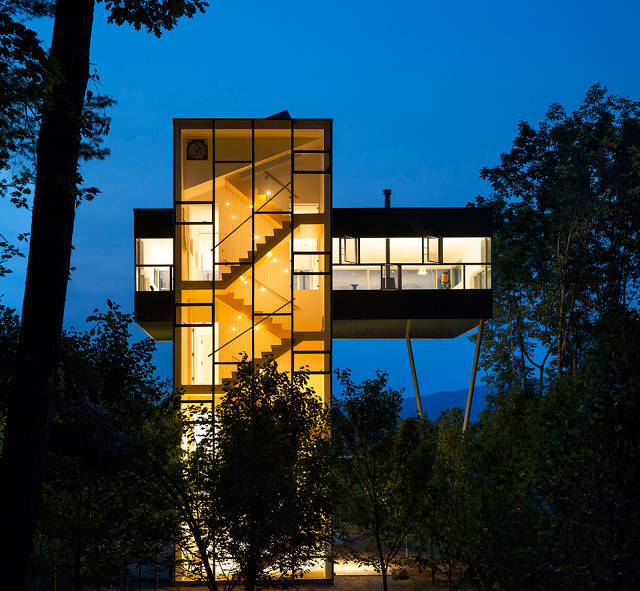 The Tower House is a 1972 project by GLUCK+, originally designed for principal Thomas Gluck at the peak of his vacation land in the Catskill Mountains. A living area protrudes from the middle of the structure and provides a fantastic view while keeping a minimally invasive base that is only 14 feet across. GLUCK+'s website touts it as "a stairway to the treetops." The design—which looks like Legos stacked up or a Jenga game about to fall—did not come without challenges. To simply balance the building, a set of steel anchors had to be drilled into the rock below, and the farthest protruding end of the living area had to be balanced on steel beams. There's a large focus on sustainability that comes with this design. The house would only be inhabited for a couple months as a vacation getaway, so an insulated core was added to help conserve heat and energy costs. The stairwell, facing south, pushes hot air out through vents on the roof then replaces it with cool air that funnels down. Energy costs have been cut by as much as half, according to the designers. Do you like this home? Why or why not?